Prairie Steps: Why Are Grown-Ups Still Coloring? Why Are Grown-Ups Still Coloring? The other day we were at my wife's grandparent's house. While my wife played Yahtzee with Papaw, I found myself doodling on the back of an old scorecard with a ballpoint pen that was on the table. This has been my custom pretty much my whole life! All through school I doodled on my papers, books, and even on my desk... and don't get me started on everything I drew on and colored on at home, including my wall! 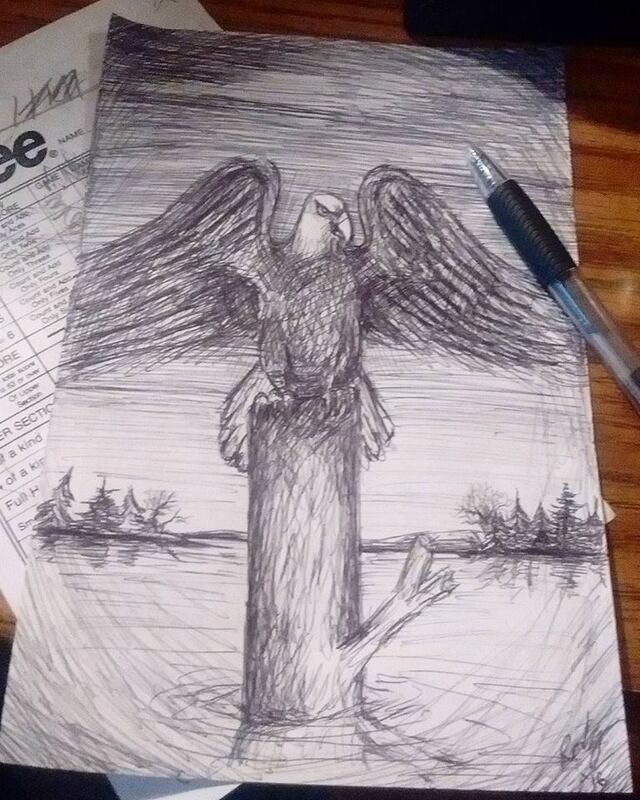 Papaw was intrigued at my doodles and asked if I could draw an eagle. While I drew him an eagle (picture below), my wife told him I was in the process of making an "adult coloring book." Now before I go on, I should point out that I've been hesitant to use the term "adult coloring book" for a few reasons. First of all it sounds dirty! Secondly, I invite all ages to color my book when I am done (if I ever get done). And the third reason is... well, keep reading. Upon hearing the term "adult coloring book," Papaw immediately started to laugh out loud. He said "I can just see them at the nursing home with their crayons!" I chuckled too, though a little embarrassed. He proceeded, "Do they do Color By Number, too?" Little did he know, last year was a booming year for illustrators. Adult coloring books were at the very top of Amazon's best sellers. Johanna Basford's Enchanted Forest: An Inky Quest & Coloring Book was off the charts. "Zen" doodles, mandala, and "Sharpie art" had become (and still are) more popular than anyone could have predicted. When I first became privy to the popularity of this hobby, I thought of all the doodles I had thrown away over the years and how I could have turned them into coloring books. I'm not going to lie, the more I thought about it the more I saw dollar signs. I've been working on a book ever since (and have found out just how difficult it is to produce a decent amount of good, quality illustrations that people will want to color). Because of the fact that I am trying to produce a coloring book, I joined a Facebook group called "Adult Coloring Worldwide." I decided to take a little survey on how many in the group colored as a child and how many started later in life. There were certainly many who jumped on the bandwagon later in life and got addicted, but overwhelmingly the members of that group loved coloring as a child. Some continued drawing and coloring their whole life (I'm sort of in that category...even though I am one of the few men in the group), and others got away from it in their high school years only to pick it up again years later. It makes perfect sense that we want to return to something we loved as a child. For many of us it was like a security blanket. It was calming and relaxing. It helped us focus. It was like... coffee! I can't explain it, and I'm not sure there has been much by way of scientific research, but many people have found coloring to be a release. Got stress? Go color. Got anxiety? Go color. Suffer with ADHD? Many are finding coloring to be helpful. 3. Coloring is good, old-fashioned fun! Look, we are American! What else are you going to do? Play video games? Watch movies? Play Yahtzee?!!! I'd rather draw. And if you would rather color, be my guest...just don't forget to buy my coloring book when it comes out!